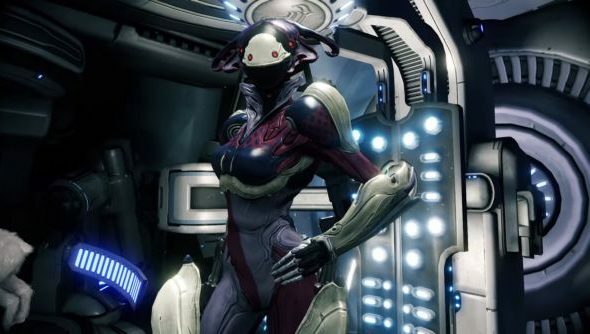 Third-person space-ninja shooter Warframe has just received a huge patch with the aptly named update 14.0. Inside is a revamped tutorial and UI, a new warframe, weapons and the introductions of pets. The new Warframe is named the Mirage – a master of illusion that confounds the enemy with smoke and mirror tactics. She’s quite snazzy. NEW USER EXPERIENCE –A meaningful Quest walks new players through Warframe, providing essential information on gameplay, lore, game modes and menus. Experience a re-imagined user interface and menus. Players have a place in the Solar System aboard their personal spacecraft, The Liset. Upon completing the ‘Vor’s Prize’ Quest, major systems, menus, and components can be accessed through devices aboard the ship! KUBROWS –A new Quest unlocks a Genetic Foundry used for breeding biological specimens on your ship! Breed a Kubrow by collecting a Kubrow egg and incubating it in the Genetic Foundry. Different Kubrow personality types have different combat and non-combat abilities. Make your Kubrow more combat effective by caring for it and equipping powerful link mods. Create genetic imprints of your Kubrow that you can trade with fellow Tenno and combine to create your perfect pet! Hall of Mirrors – Mirage creates an entourage of doppelgangers to distract and confuse the enemy. Sleight of Hand – A natural prankster, Mirage booby-traps nearby objects. Eclipse – Standing in light, Mirage becomes the main attraction, dealing heavy damage — while the shadows make Mirage difficult to track and even harder to hurt. Prism – Fires an energy orb that shoots lasers in all directions. Activating again detonates the bomb, blinding nearby foes. QUESTS –Explore re-playable Quests with unlockable difficulty selection. This new Warframe experience opens with the debut ‘Vor’s Prize’ Quest. NEW DARK SECTORS CONFLICT –Introducing a new player-versus-player game mode to replace the existing Solar Rails conflict game mode. Choose which Clan or Alliance you wish to support and play the role of Attacker or Defender on a multi-staged objective mission! Up to four human players per side, with empty player slots auto-filled by Spectres. AKZANI –The choice weapon of Mirage, these fast-firing dual pistols deliver a deadly performance. SILVA AND AEGIS –a Sword and Board style weapon created from the concept of our Community Melee Design Contest Winner – SilverBones. EXPANDED GAME MODES –The Infested have overtaken Eris. Hive Sabotage, Exterminate, and Survival Game Modes now available!